The big boys are here and biting and Ft. Lauderdale Shark fishing can be a lot of fun, especially right now. This time of year we see a good number of Kingfish on the reefs and there are days offshore that the Mahi-Mahi get top billing. Bonito, Tuna and Jacks are here and often biting as well. You might even catch a Sailfish as they are a possibility every day. We love and pursue all species here aboard the Marlin and are always ready for anything that might come our way. But a lot of people enjoy doing battle with a big fish, many of the Sharks offshore now are big fish, and Ft Lauderdale isn’t a bad place to target them. 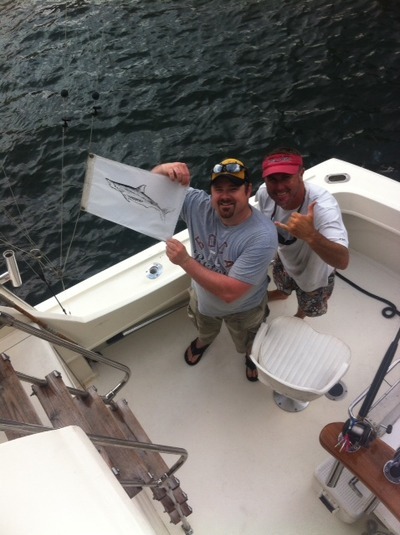 Pictured are Chad and 1st mate Dave after a successful catch and release. There are several factors involved. First is that offshore of Ft. Lauderdale is directly in the path of many species of Sharks as they work their way to the south. A second factor is the proximity of these fish to fishermen and the quick access to them. Many large sharks pass by here less than two miles from the beach, and a good number swim by a lot closer than that. And a third and important factor is that the majority of these sharks are hungry, very hungry, possibly due to the large distances they are covering on their migration route. So now is a good time for fishing here whether you are looking for a mixed bag or hoping on seeing and tangling with something truly large. Maybe a little of both. Our weather is great with only an occasional shower with good current and clear clean water. Just enough wind to make it comfortable yet not too choppy offshore.